Sydney, May 24, 2011 (Global Fashion Wire) - Chinese jewellery retailer Chow Tai Fook, controlled by billionaire Cheng Yu-tung Chairman of New World Development Co. ( HKG:0017), looks to be joining the ranks of companies aiming to IPO (Initial Public Offering) on the Hong Kong Stock Exchange. 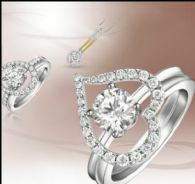 The jewellery retailer has hired a number of banks including Deutsche Bank AG ( ETR:DBK), Goldman Sachs Group ( NYSE:GS), HSBC Holdings plc ( HKG:0005) and JPMorgan Chase & Co ( NYSE:JPM) for a proposed Initial Public Offering (IPO) to raise at least US$3 billion, the offering is expected to go to market during the first quarter of 2012. With the rapid increase in percentage of consumers in global luxury-goods sales coming out of China, Chow Tai Fook joins the entourage of consumer-goods companies hoping to capitalise on the booming luxury market. Chow Tai Fook which currently holds more than 1,000 stores throughout mainland China, Macau, Hong Kong, Taiwan and Malaysia, is looking to double that amount by the year 2020.